This week I am sharing a poem that came to me at the Collegeville Writer’s Workshop last summer. But I discovered I liked wandering in its stark beauty, so I decided to stay. Leaving me free to go any way the wind blows. And the night’s cold comes so hard and fast, I can see my breath while walk on burning sand. 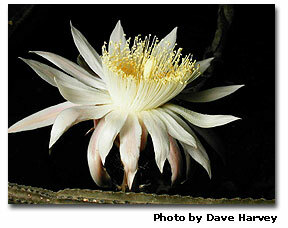 My favorite cacti is the Night-Blooming Cereus, which only blossoms one night a year. Wilderness finds virtue in hiding its light under a bushel. If you want to see the wonder you must care enough to endure. It is the same in the human wilderness. Not all beauty flaunts. One day at a time- that adds up to a new forever. While a quivering hand lights a candle of hope. and is going places where I can no longer protect it. Please bloom, dear wilderness, in my cactus heart. Thanks for sharing this beautiful poem. I love it and may use it in my sermon this next Sunday. You can read some of my writings at http://www.weimarwanderings.blogspot.com. Shalom. Peace to you as well, and thanks for taking the time to write me a note.